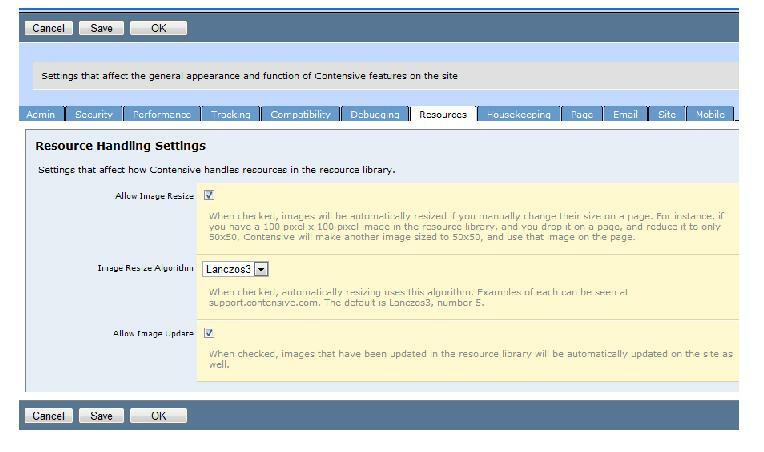 There are two automatic image control options in the Contensive Resource Library, Image Updating and Image Resizing. When enabled through the Preferences page, images that are updated in the resource library are automatically updated throughout the site. When enabled, you can resize images by stretching or shrinking images in the wysiwyg editor and saving. Contensive automatically creates a new image that is the correct size. Next, click on the Resources Tab on the right side of your screen (image below). Check the boxes next to Allow Image Resize and Allow Image Update if you want images to be automatically changed in the Resource Library when changes are made to them on a specific web page. You will also choose the method used for resizing. See the explanation below for the various options available. Make sure that you click OK when you are done to save your changes.